Even More Opportunities to Learn at NGS 2017! In just a few short days, we will join the hundreds of other genealogy enthusiasts from around the country at the National Genealogical Society Annual Family History Conference in Raleigh, North Carolina. During the conference, we will be offering a variety of mini-lectures and one and one consultations from our booth in the Expo Hall. This will be a great opportunity for attendees to continue the incredible education they are already receiving from the sessions provided in the classrooms. You can sign up today for a free 30-minute consultation to reserve your spot. Along with our own team, we're bringing in several experts to share their knowledge with you! Join us at the Findmypast booth every day for these excellent freebies! Topics will include, "Researching Irish Ancestors from America," "PERSI-bilities: Better Research with the Periodical Source Index," "Early American Research Strategies," and "Irish In America: Using Arrival and Distribution Patterns as Clues to Origin." 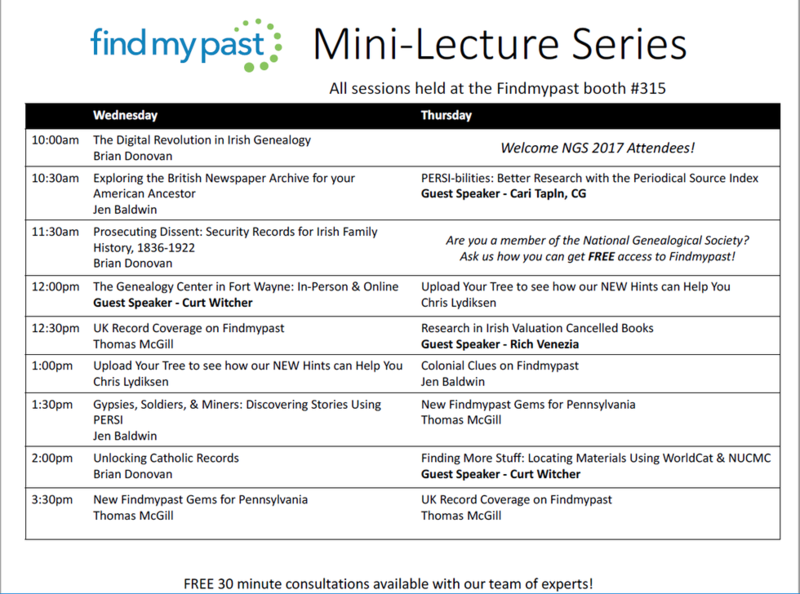 Our own team – Brian, Chris, Thomas and Jen - will include their expertise on Irish research, the new – and fantastic – records from Pennsylvania and the Catholic Heritage Archive, the wide array of material covering the British Isles, and the best tricks and tips for using the Findmypast Family Tree. We are all looking forward to discussing your family history and how we can help you reach the next milestone. We are delighted to host Elissa Scalise Powell, CG, CGL, Rich Venezia, Rorey Cathcart, Curt Witcher, Cari Taplin, and Shannon Combs-Bennett as guest speakers during the conference (pictured below). Consultations will also be available with Catherine Desmarias, Rick Fogarty, Barry Kline, and Cheri Hudson-Passey, just to name a few. Be sure to stop by booth 315 early on to grab a full schedule for the week and be made aware of any changes. In the meantime, you won't want to miss these mini-lectures.